t h e a r t o f p e r c u s s i o n , a v a n t - g a r d e a n d b e y o n d . . . 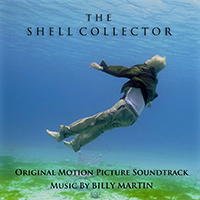 The Shell Collector is a Japanese film directed by Yoshifumi Tsubota, beautifully captured on16mm (film) on a small island in Okinawa, Japan. Based on a story by Anthony Doerr, the film is about a blind academic shell collector (Gakusha) who encounters a venomous sea snail (Imogai) which can kill a person with its venom. If stung, it induces awesome hallucinations that ends in death or a cure (for a mysterious disease that has been plaguing that region). What ensues is a boatload (no pun intended!) of trouble for this guy who just wants his solitude by the sea. Soundtrack available February 28th 2016 at iTunes, Amazon and other digital outlets.